Though having real life advice dispensed to you while reading these reviews is probably not what you’ve come to a music history blog for, consider the following a bonus for those here to read about rock ‘n’ roll, something which is free for you to take or leave at your own discretion. Here goes: In life one of the most important things you’ll ever learn is the key to basic economics… making sure your assets are greater than your debts. So too in music where artists remain viable over time by continually offering material that keeps them on the black side of the ledger. Economics should by all rights be far more prevalent in education since it’s something that everybody, no matter what career they pursue, will have to know and practice to stay solvent. Yet – in American schooling anyway – it takes a back seat to other studies… including ironically enough both music and history classes. But of course most school systems inaugurated their curriculum long before Spontaneous Lunacy came into being and showed how to combine music and history into one lavishly written, highly entertaining ongoing lesson! Anyway, back to the task at hand which is debating the merits of certain courses in school. Certainly reading is the most important thing you’ll learn because that’s the foundation of learning itself – case in point, how else would you get anything from this site without being able to read? It also helps if you can write since that’s a cornerstone of communication as well, but the rest of the classes you probably took in school – or are still taking – aren’t going to have nearly as profound an effect on your life as economics will. Yet sadly economics is often nothing more than an elective you can take for a semester or two and even then you’ll probably learn big picture things, like micro and macro economic theories, rather than simply how to budget properly in your own life to ensure you don’t spend more than you earn, the importance of keeping out of debt and avoiding the black hole of interest charges and how to invest money to make your dollars work FOR you to bring in more dollars. Basic stuff I know and seemingly unrelated to music. Yet it’s the same principle IN music when it comes to your output as an artist. 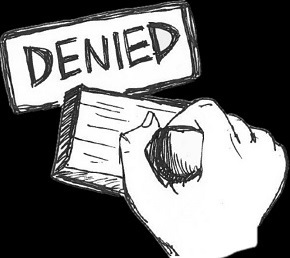 Each record you release doesn’t necessarily have to advance your standing with audiences but it damn sure had better not reduce your standing if you want to remain solvent. We may celebrate those who take great leaps forward, who seem to break new ground and set new trends and score tons of hits, and sure, those are the ones who become the era defining stars. But for most artists that’s not in the cards. You may wish to be that big but your talents preclude that. You’re good at what you do but not transcendent so you need to adjust your goals a little. Set a more reasonable budget if you will. That’s exactly what Jimmy Preston has done thus far in his career and done quite well at that. There’s something to be said for being in the right place at the right time as Jimmy Preston would surely attest. He was in his mid-30’s and was merely a decent club attraction around Pennsylvania when a local label sought to get into the rock ‘n’ roll sweepstakes at the peak of the sax revolution. Preston was a local guy who blew a decent sax, albeit an alto sax rather than tenor, and who had a pretty tight band with the requisite energy to pass themselves off as rockers, not to mention having no real ties to jazz to keep them from resisting such a move, and after Gotham Records inked them to a deal in late 1948 they found themselves gradually moving up the ladder through a process of trial and error. With no real expectations, either on Gotham’s part or from a prospective audience, Preston and company were free to experiment and see what worked. Using the existing rock landscape as their starting point they came up with a fair instrumental in that realm, the cleverly named Messin’ With Preston, to launch their careers and make known their intent as rockers. While sticking with instrumentals might’ve been the surest way to try and score a hit they wisely cut some vocal sides to expand their options going forward (in investing this is called diversifying your portfolio) and though some of these early efforts fell flat, others showed them to be quick studies and more than capable at least holding their own. Most of the releases were an improvement over what preceded it and by the spring they’d notched their first hit with Hucklebuck Daddy before unleashing the fury of Rock The Joint in summer to give them another big seller and add to their blue chip stocks. The goal in music and in money is simple – advance, don’t retreat. Not everything has to be a smash but you always want to release something that listeners will see as a good buy, records where they know they’ll get their money’s worth and not be disappointed. Preston was following that advice admirably as Credit Blues makes clear, not just with its lyrical content – in case you were wondering why we’re having this sidetrack into economic advice – but more importantly with its musical content, which is another strong investment on his part. A siren-like horn spiraling upwards… slamming drums acting as a violent punctuation… a dramatic stop-start pattern to get your heart racing… not a bad opening for a mere B-side. Truthfully not a bad way to kick off a hotly anticipated A-side either for that matter. The excitement dials itself back after that intro as Preston comes in shilling similar advice to what we handed out at the start of this review. As such thematically speaking Credit Blues is an interesting concept, albeit one that’s got its basis in the songs of other melodically. It’s not quite a down the line rip-off of anything maybe, but it’s just the basic framework is the kind that gets recycled a lot. Chubby Newsom used something similar for Bedroom Blues, albeit far slower, and you’ll find it in one form or another in lots of other songs if you look. But that’s okay, we’re not criticizing the appropriating of some of the musical elements, we’re more interested in how those elements are played and what they’re supporting in terms of lyrics and delivery. As to the first question, after that kickin’ lead-in the band settles down a little TOO much. This is especially true because of the way the song is framed. The lyrics are delivered by Preston in a stop-time, almost semi-spoken way, which means the instruments drop out while he recites each line. The drums add an exclamation point between them, fairly effective but still obviously limited in what it can contribute in such a brief rejoinder, before picking it back up as he segues into the chorus. But if that’s the approach you’re going to take then the others in the band, particularly the horns, have to be a lot more calamitous in their playing to give us a proper pay-off when the time comes. The verses do their part in building it up but the chorus fizzles more than explodes. To use another example taken from one of the methods kids learn economics growing up, this is like landing on Community Chest in Monopoly and being forced to pay $150 school tax. But on your next roll of the dice you might get a few bucks back as the sax solo that follows is fairly good… in a mellow sort of way, meaning it’ll keep you in your seat rather than get you on your feet. Maybe that’s a let down since usually it’s the saxophones which provide much of the thunder on the best rock songs, but you won’t find fault with what is being played here even if you’d like it a little more assertive at times. Because of that the drums remain the most lively part of the arrangement even though they’re basically just keeping time. Which brings us to the second question regarding what this music is supporting… that would be Jimmy Preston, vocalist, in case you forgot. As we’ve said countless times Preston was a vocalist of necessity more than he was a typical frontman. He was far better at the job than most sax players you could find, but then again he wasn’t nearly as good of a sax player as his competitors, so he probably had to do something to earn his headlining status. But while Preston doesn’t possess dynamic range, a crystalline tone or a commanding vocal presence, he does have an uncanny way of putting a song across that gives every indication he is singing the songs as if they’d actually happened to him and he’s now recounting it rather than simply reading them off a lead sheet. This quality was evident from the very start of his recording career and if anything he’s improved on it since then which makes a huge difference on Credit Blues where he’s got to be able to convince you that he speaks from experience. The song was written by guitarist Harry Crafton and Wendell Keene, two of the three guys who penned Rock The Joint, and it’s not hard to imagine session musicians like them knowing a thing or two about living hand to mouth considering the going rate for a session was pretty skimpy. Preston must have some knowledge of that type of existence too because he shades the lyrics properly, adding a hint of hope in certain lines before pulling it out from under himself with the pay-offs, all while not telegraphing anything, nor trying to put too much humor in it as if this type of hardscrabble living was something to make light of. The examples they serve up are colorful enough to draw a smile without trying for outright laughs. Even when he’s missing out on dates, not to mention dinner, because of his empty wallet he’s keeping it poignant enough to match the mellower mood the record is giving off. Better still he’s not laying blame on anyone, including himself notably, and rather treating it as a matter-of-fact occurrence. Taking this as semi-autobiographical, at least before their ship came in with their success over the past year, this is the life they signed up for as musicians – guys with big dreams but low odds at those dreams paying off. As such Credit Blues is more an accurate reflection of life rather than a lesson on how to avoid such a fate. Each part fits together well enough, even the seemingly ad-libbed shouts in the instrumental break add to the flavor as Preston yells out, “Pay that debt”, as if he was hoping the other horns could get his alto out of hock so he could join them. It’s a modest song with modest aims but it reaches them with enough room to spare so the bill collectors don’t get their hand in his pocket before he manages to close the door. We started off the review with some advice, so that’s how we’ll close it too. This one is more centered on the record trade, though it certainly ties in to economics in a way. Someone like Jimmy Preston didn’t have a lot to invest when starting out. His name recognition, if any, wouldn’t extend far beyond the city limits, and his talent, and that of his band, was decent enough but hardly anything special. But Preston took what little pocket change he had and put it in a low risk investment (like bonds) with an instrumental which did just well enough locally to earn him another release. Then the follow-up showed he could reasonably deliver a vocal turn in much the same modest manner that it convinced Gotham Records to keep him on board. It’s not like they had many options mind you, but we’d see them dump Eddie Woodland, a far better sax player than Preston, a few months down the road, so it wasn’t like the label was magnanimous with their contracts. Each time out Preston did just enough to surpass expectations it seemed, in the process raising those expectations a little bit more. Then he’d promptly exceed those as well. There was never a huge step back, never any sign that he was taking random shots in the dark, placing his money on some long shot fly-by-night investment opportunity that might possibly get big returns if things broke right, but more than likely would crash and leave you broke. Instead Preston calmly studied the market, weighed his best options and went with low risk stocks. With what little he was buying he wasn’t going to get rich, but he also wasn’t going to lose any money either and it was buying him time… time which he used to his advantage. Once he saw a signs of a Bull Market he correctly hopped on the stocks that were starting to rally, writing a song to capitalize on The Hucklebuck craze, then pooling his resources and investing heavily in a song that had the makings of rock anthem. Once these paid well he didn’t foolishly blow his profits chasing short term gains that might just as likely bottom out, instead, with both sides of this record, he was now making safe long term investments. Sticking to what earned a slow but steady profit, things which weren’t prone to suffer much during periods of market volatility. Credit Blues is just an average rock record for 1949, nothing more, nothing less, but it’s also just a B-side to a better than average record, and the combination of which means his portfolio is guaranteed to show a healthy profit for the year. This strategy had paid off big last time out and so now he settled back once again, biding his time, waiting until the next opportunity to come along. It might not be the sexiest advice but Jimmy Preston would always have those dollars in his pocket to get by when the market turned. 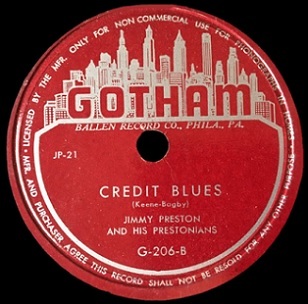 Leave a reply on "Jimmy Preston: “Credit Blues”"